Whether you’re 6 or 60, your path through life has probably been guided in more ways than you completely realize by a short list of individuals who inspired you. Maybe they opened your eyes to an unforeseen opportunity. Maybe they challenged you to reach higher than you thought you could, and helped you believe in yourself. Maybe they guided you over a rough spot when all your dreams seemed to be coming apart. Maybe they modeled the kind of honesty, integrity, and generosity that drew you to them—and made you want to follow their example. We call those people mentors. And the gifts they give us are priceless. I have been fortunate to have been guided by a number of wonderful mentors. First and foremost were my parents—free spirits who taught me to love learning and seek out new experiences. Then there was a chemistry teacher in 10th grade who inspired me to pursue a career in science. And there were many others in college, graduate school, medical school, and beyond. 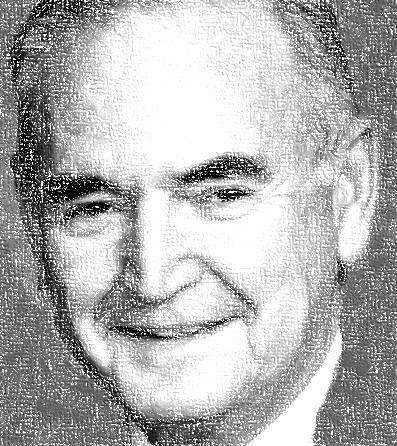 Henry Neil Kirkman, Jr., M.D. But today, I want to recognize Henry Neil Kirkman, M.D., a dedicated pediatrician in North Carolina who introduced me to the amazing field of human medical genetics and started me down a lifelong path of discovery. I met Dr. Kirkman in December 1973. I was a first year medical student at UNC Chapel Hill, and he had come to my class to teach just three lectures in genetics. I had migrated into medicine from physical chemistry, but I was still searching for something that would unite my affection for mathematics with my awe and appreciation for the intricacies of the human body. Dr. Kirkman’s approach to teaching was perfect—he taught us the principles of inheritance, and he insisted that we not memorize anything (which was in stark contrast to the rest of the medical school curriculum!). Most important, however, was that he brought patients to class. As he presented a child with Down syndrome and a young man with sickle cell disease, I could see the connection between those abstract concepts of inheritance and their human consequences. And I was utterly transformed. I knew I wanted this to be my lifelong focus in medicine. As a medical student I only met with Dr. Kirkman occasionally, but his influence was profound. He was always soft-spoken, modest, and self-effacing—but his dedication to patients, research, and teaching spoke volumes. He showed me how merging genetics and medicine could become a vision for the future. That vision became an abiding passion for me, giving rise to the development of gene hunting techniques that ultimately led to the discovery of the cystic fibrosis gene—and other puzzles in human genetics that continue to intrigue me to this day, as my lab conducts research on diabetes and aging. I was saddened to hear of Dr. Kirkman’s passing a few days ago. I will miss him, and I will always be grateful that I had a chance to tell him what a profound impact he had on me. Do you have mentors that have given you gifts of inspiration and encouragement? I hope so. And if you do, and if you have never told them how much that meant, this would be a great day to write a note. The word mentor has a very old origin. In Greek mythology, Mentor was a friend of Odysseus (Ulysses in the Latinized version) who placed Mentor in charge of his son Telemachus, and of Ulysses’ palace, when Ulysses left for the Trojan War. So the importance of mentors was already known at the time of Homer in the 7th or 8th centuries BC. In occasion of the recent death of Dr. Henry Neil Kirkman, Dr. Francis Collins remembers the mentors that influenced his life. Above all, he tells us about the strong and important impact that Neil Kirkman had on him as a young medical student, suddenly illuminating him towards the scope of his life, springing him in his brilliant career and his relevant achievements in the field of human genetics. Dr. Henry Neil Kirkman was my mentor too. I met him as a post-doctoral fellow in the early ’70 of the past century. At that time his reputation as an expert in biochemical genetics was already known worldwide. I spent almost two years in his lab while also attending the Genetics Counseling Clinics. In his lab Neil trained me on red cell metabolism with special emphasis on G6PD deficiency, the most common human enzyme defect in the world. There, under his guidance I learned all the sophisticated mechanisms of G6PD regulation. Neil was very patient with me, teaching me step by step how to interpret results and then to continue to ask the reason of those results. But more important to me as a mentor was his ethics toward science and his profound humanity to young patients and parents. When I returned to my home country, year after year we worked together – exchanging our ideas, results and work at first by traditional mail, often crossing the ocean to discuss things until the computer era made things easier – for almost four decades, finally devoting our interests to the antioxidant mechanisms of the red cell with unexpected and relevant results. And still until the very end we had new projects that we hoped to develop together. During my lifetime work with Neil Kirkman a very strong bond was formed between us and his death has left me with a sense of emptiness which is partly mitigated by the many and nice episodes that filled our unforgettable friendship.